Do you have a page with a lot of content divided up using Heading 5s or Heading 6s? Would you like to offer a "consolidated" view of your content when your visitors first land on your page? You may want to consider the "collapsible list" content feature. A collapsible list will show and hide a given section of content when its heading is clicked. The collapsible list will appear initially as a series of Heading 5s or Heading 6s with an arrow next to each. Click a heading once to expand the content, and again to close it. You can see this feature in action on our office's presentations page. Create a one column table with a row for each section of content to be collapsed. In each cell, start with either a Heading 5 or Heading 6 to serve as the clickable area to open/close the content. 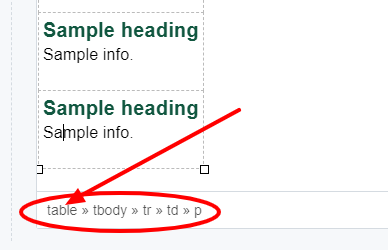 Below the heading, enter the content to be collapsed in the same table cell. Repeat for each section of content, placing each section in its own table cell. Apply the collapsible format to the table: Select your table by placing your cursor anywhere within the table, click "table" in the element path breadcrumbs at the bottom of the editor. Then select collapsible from the Formats >> Custom sub-menu. Click Submit >> Check Content & Submit. Then publish.